Bristol University researchers have published results into a study for detecting blockages in pitot tubes using acoustic methods. Pitots, which provide airspeed data, have played a role in several aircraft accidents, including the fatal Air France Flight 447 in 2009 and possibly the Saratov Airlines crash near Moscow in February 2018. New research by aerospace engineers at the University of Bristol has found that an acoustic blockage-detection system could prevent future accidents by making pilots aware of a blocked Pitot before a situation becomes critical. Acoustic methods have been used for detecting blockages in pipes and even the ears of newborn babies for many years. 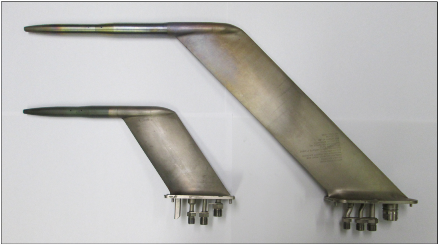 The study, published in Journal of Aircraft, set out to discover if similar methods could be used for real aircraft Pitot tubes, which can contain irregular shapes and passages, without needing a very complicated detection method. The approach has been proposed before, but no substantial data, either experimental or simulated, has been published until now. The researchers wanted to find out if it would be possible to detect common blockage types that aircraft face, including tape, ice and insects. Three Pitot-statics from two different commercial aircraft were X-rayed by a CT scanner and an acoustic study was carried out to find out the variation between blocked and unblocked reflected acoustic waves. Experiments using a range of blockage types, including tape, insects, foam and metal, were also conducted on the same tubes. The research found it is possible to detect blockages reliably, even for particularly small tubes, and for tubes containing non-cylindrical shapes. However, for the method to work well it is necessary for there to be a simple tube along most of the length of the pressure duct. Dr Thomas Rendall, Senior Lecturer in the Department of Aerospace Engineering at the University of Bristol and co-author on the paper, said: “In principle the method could be adopted to help inform pilots if Pitots are blocked before they take off, or if they subsequently become blocked during a flight. The data from the study is only for a Pitot in an aircraft on the ground. The next phase of the research would be for the system to be tested for in-flight operation, which would require detailed noise data from a real aircraft. The system would also need to be made smaller to fit into the tight confines of an aircraft structure. The research team recommend that now would be a good opportunity for industry to start testing a flight operable system, as they have access to data and equipment. The paper is ‘Acoustic reflectometry for Pitot-tube blockage detection’ by J Rodrigues, S Grey, M Azarpeyvand and T C S Rendall, published in Journal of Aircraft.